The fifth Maserati Quattroporte model series is saying farewell after being available on the market for nine consecutive years. This current Quattroporte model series was unveiled to the world at the Frankfurt Motor Show in 2003 and made its US premiere at the 2003 Pebble Beach Concours d’Élégance. After all those years and with a successor is in the works, we had to take a look at the most potent version available to this date; the Quattroporte GT S.
The beautiful, performance-oriented Italian luxury was in our hands for a whole weekend in February. More than enough time to enjoy, experience and travel around in Maserati’s most driver-focused Quattroporte ever created. The Sport GT S combines all of the best features to have trickled into the gorgeous Italian four-door since it launch. The package offers a performance upgrade to 440 horsepower, tuned suspension, a sports exhaust, a Brembo brake kit and styling modifications. Our transport for the weekend featured a Nero Carbonio Black exterior color trim and an all-leather Nero Black interior, approving the slightly inappropriate image. The design of the Quattroporte Sport GT S did put the accent on sport, but without compromising the style and elegance that has always been a feature of Maserati’s flagship model. After all these years the exterior design still feels contemporary. Under the hood of the Maser, you will find a Ferrari-built 4.7 liter V8 linked to a ZF six-speed automatic transmission producing 440hp at 7,100rpm and a maximum torque of 510Nm at 4,750rpm. With respect to its early year models, these figures have been increased by modifying the engine’s electronic control parameters. The redline is positioned at 7,200rpm. A sprint from zero to 100km/h is done 5.0 seconds using the launch control system. The top speed is 287km/h. The engine is a wonderful sounding masterpiece fitted with a free-flowing valve-controlled sports exhaust system. In Normal mode, the manifold valves force the gases through a complex pipe work to allow just a restrained warble to reach the cabin. By engaging Sport mode all hell breaks loose. In any gear, the exhaust produces a throaty roar at low engine speeds and the full symphonic sound of a genuine sports car at higher rpm. A true feast for your ears. The exhaust noise is a bit too prominent on longer journeys, but superb for city driving and departures or arrivals. Switching back to normal mode is the easiest way to enjoy the Italian refinement in near silence. The gearbox is a swift gear changing transmission offering snappier changes than its predecessors due to its special performance MC-Auto Shift software treatment. Smooth, intuitive auto shifts are bettered only by downshifts with a glorious throttle-blip in manual mode. The central driver’s display tells the driver the optimal timing to pull the Trofeo-style shift paddles fixed to the column behind the steering wheel. Aluminum pedals are available as optional equipment. In both manual and automatic modes the GT S offers enough playing room to accompany its driving characteristic. The suspension stiffening of 30 percent at the front and 10 percent at the rear is easily noticeable to those who have driven the older and standard version of the Quattroporte. The sport button offers more than just an intoxicating roar. Engaging the sport setting will also introduce a noticeably firmer ride, where the Normal mode is the more comfortable option. The reduction in ground clearance by 10mm at the front and 25mm at the rear axle provides a more aggressive look and better handling through sharp corners and bends. While cornering there is a little sign of understeer, but in the end the handling and ride are the weakest points of this ageing Maserati. The upcoming sixth model series should see a definite improvement on these subjects closing the gap with the current competitors which provide a more rounded package. The ultimate benchmark is the Porsche Panamera, which combines the playfulness of a 911 in a remarkable high-end luxury sedan package. The grille is the most obvious change on the outside combined with a different front bumper, headlamps in a metallic titanium finish and shadow-line finishing. At the rear, oval tailpipes, shared with the GranTurismo S, distinguish the Sport GT S model from other Quattroporte models. The Quattroporte Sport GT S is available with two types of 20 inch wheel rims: Multi Trident rims in light aluminum alloy as optional or seven-spoke light alloy rims that have undergone the ‘Dark Chrome’ treatment. Inside the cabin, you position yourself on leather seats, if requested with central sections upholstered in perforated Alcantara suede. Alcantara can also fitted on the door side panels, the front armrest, the steering wheel and the gear lever knob. Our test vehicle had the full carbon fiber interior trim. The seating position feels dated and needs improvement, especially for longer people. Same goes for the center console, which offers all the driver’s wishes but can hardly compete with all those tech-gismos inside multimedia systems fitted by competitors. 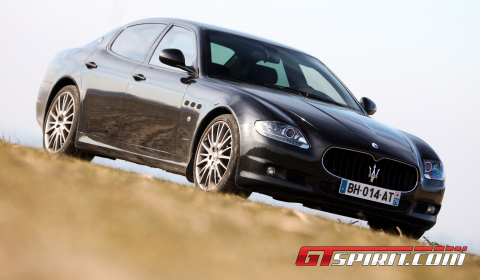 The fifth Maserati Quattroporte is going to leave us soon. 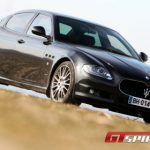 Its successor is knocking on the door and the new Quattroporte will soon be ready for new markets like China and India. With Maserati being positioned more and more as a luxury, but sporty car brand, the outgoing Maserati Quattroporte GT S leaves us with a similar heritage of eight years of Italian refinement and luxury passion. A mixture between luxurious travelling, in-your-face elegance courtesy of a design by Italy’s Pininfarina design house and the sportiveness fueled by sister company Ferrari. The Maserati Quattroporte has always been a luxury sedan with its own character, one you either love or hate, but in any single way a pleasant travel companion. Over the past years the Quattroporte has been overtaken by competitors on subjects such as fuel economy, interior refinements, handling and steering, but it never lost any of its brilliance. The Quattroporte says farewell with those superb looks and a wonderful roar kept in our mind, to return in a new package ready to take on the competition.